Do you ever think to yourself that sometimes you would just like a change? Do something different or out of the ordinary? There’s nothing wrong with that at all, as they say variety is the spice of life and a bit of variety never did anyone any harm. So, what bit of variety are you going to inject into your life? If you live in Saffron Walden then you already have a bit of spice, namely the world’s most expensive one, but what about actual changes? A new job, a new house, or what about a new food? What about a Taste the Cracklin hog roast in Saffron Walden change? Why not? Hog roast is ideal for a town like Saffron Walden. Saffron Walden has a wealth of medieval roots, after all. And as everyone knows, it is a medieval dish that has stood the test of time. So what about injecting a bit of Saffron Walden excitement into your dining? It may sound an over the top and expensive (just like saffron) but prepare to be surprised. Getting a slice of Taste the Cracklin action at your event or function is one of the most cost effective catering solutions there is. A lot of people forget that it is really just that; a whole pig roasting away, and that means a lot of meat. Enough in fact to feed over one hundred Saffron Walden diners, and that means more people can eat for less at your event. Taste the Cracklin also gives your guests a little something to watch and enjoy. It’s one of the most visually appealing and mesmerising culinary events you will ever witness as the Taste the Cracklin chef slowly roasts the pig until it reaches cooking perfection. Six hours roasting is how long the typical hog roast takes, but it’s worth every single minute. Your Saffron Walden event is not just about the looks and the time it takes to cook a hog roast. You need to remember that the meat has to be up there with the best, so don’t your worry. The chef only uses the great quality meat from a highly reputable source. And we all know that great quality meat and professional cooking always delivers superb flavours. 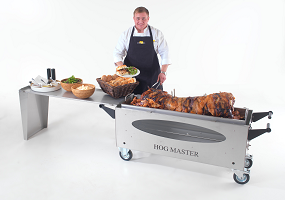 Your guests deserve great food and that is what hog roast gives them. If you have never been lucky enough to attend a Taste the Cracklin event before then you have to believe me when I say that it is one of the absolute best tasting meats you will ever taste, whether in a roll with sauces or as a more formal sit down meal with potatoes, apple sauce and all the other essentials. Hog roast has a tender, juicy texture and a heavenly taste that is like nothing else. Children love it (especially the crispy crackling) as do the adults, who always love a good roast. Spice up your Saffron Walden event by making Taste the Cracklin’s hog roast the five star attraction that everyone will want a piece of.